· Anonymous - You are a princess! · Anonymous - Thanks a lot! Lestrade leads the boys up a circular staircase. He and John are wearing coveralls together with white cotton coverings over their shoes, and latex gloves. Sherlock is putting on latex gloves as they go up the stairs. LESTRADE: I can give you two minutes. SHERLOCK (casually): May need longer. LESTRADE: Her name’s Jennifer Wilson according to her credit cards. We’re running them now for contact details. Hasn’t been here long. Some kids found her. LESTRADE (startled): I didn’t say anything. SHERLOCK: You were thinking. It’s annoying. SHERLOCK (sarcastically): Yes, thank you for your input. SHERLOCK (still looking at his phone): Of course she’s not. She’s from out of town, though. Intended to stay in London for one night ... (he smiles smugly when he apparently finds the information he needed) ... before returning home to Cardiff. SHERLOCK: So far, so obvious. LESTRADE: What about the message, though? SHERLOCK (ignoring him and looking at John): Doctor Watson, what do you think? SHERLOCK: Of the body. You’re a medical man. LESTRADE: Wait, no, we have a whole team right outside. SHERLOCK: They won’t work with me. LESTRADE: I’m breaking every rule letting you in here. SHERLOCK: Yes ... because you need me. LESTRADE: Yes, I do. God help me. LESTRADE (a little tetchily): Oh, do as he says. Help yourself. LESTRADE: Anderson, keep everyone out for a couple of minutes. JOHN (softly): What am I doing here? SHERLOCK (softly): Helping me make a point. JOHN (softly): I’m supposed to be helping you pay the rent. SHERLOCK (softly): Yeah, well, this is more fun. JOHN: Fun? There’s a woman lying dead. SHERLOCK: Perfectly sound analysis, but I was hoping you’d go deeper. JOHN: Yeah ... Asphyxiation, probably. Passed out, choked on her own vomit. Can’t smell any alcohol on her. It could have been a seizure; possibly drugs. SHERLOCK: You know what it was. You’ve read the papers. JOHN: What, she’s one of the suicides? The fourth ...? LESTRADE: Sherlock – two minutes, I said. I need anything you’ve got. SHERLOCK (standing up, while John struggles to get to his feet): Victim is in her late thirties. Professional person, going by her clothes; I’m guessing something in the media, going by the frankly alarming shade of pink. Travelled from Cardiff today, intending to stay in London for one night. It’s obvious from the size of her suitcase. SHERLOCK: Suitcase, yes. She’s been married at least ten years, but not happily. She’s had a string of lovers but none of them knew she was married. SHERLOCK (pointing down to her left hand): Her wedding ring. Ten years old at least. The rest of her jewellery has been regularly cleaned, but not her wedding ring. State of her marriage right there. The inside of the ring is shinier than the outside – that means it’s regularly removed. The only polishing it gets is when she works it off her finger. It’s not for work; look at her nails. She doesn’t work with her hands, so what or rather who does she remove her rings for? Clearly not one lover; she’d never sustain the fiction of being single over that amount of time, so more likely a string of them. Simple. SHERLOCK: It’s obvious, isn’t it? JOHN: It’s not obvious to me. SHERLOCK (pausing as he looks at the other two): Dear God, what is it like in your funny little brains? It must be so boring. SHERLOCK: Her coat: it’s slightly damp. She’s been in heavy rain in the last few hours. No rain anywhere in London in that time. Under her coat collar is damp, too. She’s turned it up against the wind. She’s got an umbrella in her left-hand pocket but it’s dry and unused: not just wind, strong wind – too strong to use her umbrella. We know from her suitcase that she was intending to stay overnight, so she must have come a decent distance but she can’t have travelled more than two or three hours because her coat still hasn’t dried. So, where has there been heavy rain and strong wind within the radius of that travel time? SHERLOCK (turning to him and speaking in a low voice): D’you know you do that out loud? JOHN: Sorry. I’ll shut up. SHERLOCK: No, it’s ... fine. LESTRADE: Why d’you keep saying suitcase? SHERLOCK (spinning around in a circle to look around the room): Yes, where is it? She must have had a phone or an organiser. Find out who Rachel is. LESTRADE: She was writing ‘Rachel’? SHERLOCK (sarcastically): No, she was leaving an angry note in German(!) Of course she was writing Rachel; no other word it can be. Question is: why did she wait until she was dying to write it? LESTRADE: How d’you know she had a suitcase? SHERLOCK (pointing down to the body, where her tights have small black splotches on the lower part of her right leg): Back of the right leg: tiny splash marks on the heel and calf, not present on the left. She was dragging a wheeled suitcase behind her with her right hand. Don’t get that splash pattern any other way. Smallish case, going by the spread. Case that size, woman this clothes-conscious: could only be an overnight bag, so we know she was staying one night. SHERLOCK: Now, where is it? What have you done with it? LESTRADE: There wasn’t a case. LESTRADE: There wasn’t a case. There was never any suitcase. SHERLOCK: Suitcase! Did anyone find a suitcase? Was there a suitcase in this house? LESTRADE: Sherlock, there was no case! SHERLOCK (slowing down, but still making his way down the stairs): But they take the poison themselves; they chew, swallow the pills themselves. There are clear signs. Even you lot couldn’t miss them. LESTRADE: Right, yeah, thanks(!) And ...? SHERLOCK: It’s murder, all of them. I don’t know how, but they’re not suicides, they’re killings – serial killings. SHERLOCK: We’ve got ourselves a serial killer. I love those. There’s always something to look forward to. LESTRADE: Why are you saying that? SHERLOCK (stopping and calling up to the others): Her case! Come on, where is her case? Did she eat it?(!) Someone else was here, and they took her case. (More quietly, as if talking to himself) So the killer must have driven her here; forgot the case was in the car. JOHN: She could have checked into a hotel, left her case there. LESTRADE (leaning over the railings): What is it, what? SHERLOCK (smiling cheerfully to himself): Serial killers are always hard. You have to wait for them to make a mistake. LESTRADE: We can’t just wait! SHERLOCK: Oh, we’re done waiting! SHERLOCK: Look at her, really look! Houston, we have a mistake. Get on to Cardiff: find out who Jennifer Wilson’s family and friends were. Find Rachel! LESTRADE (calling after him): Of course, yeah – but what mistake?! ANDERSON: Let’s get on with it. (Forgotten by everyone else, John hesitates on the landing for a moment and then slowly starts making his way down the stairs. A couple more police officers hurry up and one of them bumps against him, throwing him off-balance and making him lurch heavily against the bannisters. The man hurries on without a word, although his colleague does at least look apologetically at John as he passes. John regains his balance and continues down the stairs. DONOVAN: Yeah, he just took off. He does that. JOHN: Is he coming back? DONOVAN: Didn’t look like it. JOHN: Sorry, where am I? JOHN: Right. Er, d’you know where I could get a cab? It’s just, er ... well ... (he looks down awkwardly at his walking stick) ... my leg. DONOVAN: Er ... (she steps over to the tape and lifts it for him) ... try the main road. JOHN (ducking under the tape): Thanks. DONOVAN: But you’re not his friend. DONOVAN: He doesn’t have friends. So who are you? JOHN: I’m ... I’m nobody. I just met him. DONOVAN: Okay, bit of advice then: stay away from that guy. DONOVAN: You know why he’s here? He’s not paid or anything. He likes it. He gets off on it. The weirder the crime, the more he gets off. And you know what? One day just showing up won’t be enough. One day we’ll be standing round a body and Sherlock Holmes’ll be the one that put it there. JOHN: Why would he do that? DONOVAN: Because he’s a psychopath. And psychopaths get bored. LESTRADE (calling from the entrance to the house): Donovan! DONOVAN (turning and calling to him): Coming. DONOVAN: Stay away from Sherlock Holmes. Not long afterwards, John is walking down what may well be Brixton High Road. He tries to hail a passing taxi. MAN’s VOICE: There is a security camera on the building to your left. Do you see it? JOHN (frowning): Who’s this? Who’s speaking? MAN’s VOICE: Do you see the camera, Doctor Watson? JOHN: Yeah, I see it. MAN’s VOICE: There is another camera on the building opposite you. Do you see it? MAN’s VOICE: And finally, at the top of the building on your right. JOHN (into phone): How are you doing this? MAN’s VOICE: Get into the car, Doctor Watson. MAN’s VOICE: I would make some sort of threat, but I’m sure your situation is quite clear to you. A few moments later he is sitting in the back seat of the car as it pulls away and drives off. An attractive young woman is sitting beside him, her eyes fixed on her BlackBerry while she types on it. She is pretty much ignoring him. WOMAN (smiling brightly at him for a moment before returning her gaze to her phone): Hi. 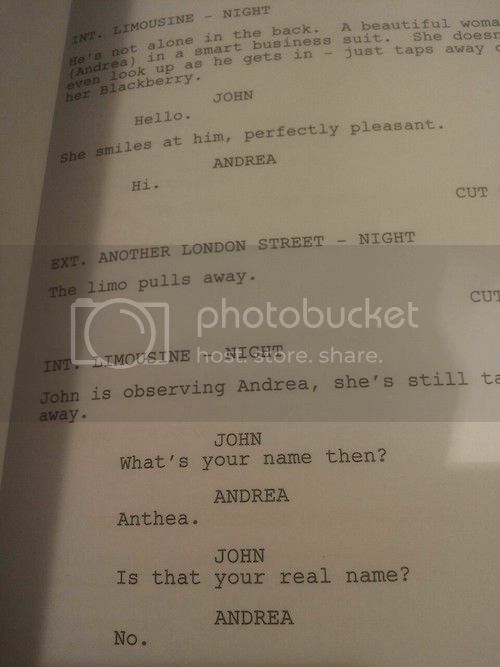 JOHN: What’s your name, then? JOHN: Is that your real name? JOHN: Any point in asking where I’m going? Some time later, the car pulls into an almost-empty warehouse. A man in a suit is standing in the centre of the area, leaning nonchalantly on an umbrella while he watches the car stop and John get out. In front of the man is a straight-backed armless chair facing him. He gestures to it with the point of his umbrella as John limps towards him leaning heavily on his cane. M: Have a seat, John. JOHN: You know, I’ve got a phone. JOHN: I mean, very clever and all that, but, er ... you could just phone me. On my phone. M: When one is avoiding the attention of Sherlock Holmes, one learns to be discreet, hence this place. M: The leg must be hurting you. Sit down. JOHN: I don’t wanna sit down. M: You don’t seem very afraid. JOHN: You don’t seem very frightening. M: Ah, yes. The bravery of the soldier. Bravery is by far the kindest word for stupidity, don’t you think? M: What is your connection to Sherlock Holmes? M: Mm, and since yesterday you’ve moved in with him and now you’re solving crimes together. Might we expect a happy announcement by the end of the week? JOHN: Interested in Sherlock? Why? I’m guessing you’re not friends. M: You’ve met him. How many ‘friends’ do you imagine he has? I am the closest thing to a friend that Sherlock Holmes is capable of having. M: In his mind, certainly. If you were to ask him, he’d probably say his arch-enemy. He does love to be dramatic. JOHN (sarcastically): Well, thank God you’re above all that. M: I hope I’m not distracting you. JOHN (casually): Not distracting me at all. M: Do you plan to continue your association with Sherlock Holmes? JOHN: I could be wrong, but I think that’s none of your business. M (a little ominously): It could be. M: If you do move into, um ... two hundred and twenty-one B Baker Street, I’d be happy to pay you a meaningful sum of money on a regular basis to ease your way. M: Because you’re not a wealthy man. JOHN: In exchange for what? M: Information. Nothing indiscreet. Nothing you’d feel ... uncomfortable with. Just tell me what he’s up to. M: I worry about him. Constantly. JOHN (insincerely): That’s nice of you. M: But I would prefer for various reasons that my concern go unmentioned. We have what you might call a ... difficult relationship. JOHN (in response to the man’s offer): No. M: But I haven’t mentioned a figure. JOHN (putting his phone away again): Don’t bother. M (laughing briefly): You’re very loyal, very quickly. JOHN: No, I’m not. I’m just not interested. M (gesturing slightly to make it clear that he is reading a note from the book): “Trust issues,” it says here. M (still looking down at his book): Could it be that you’ve decided to trust Sherlock Holmes of all people? M: You don’t seem the kind to make friends easily. M: I imagine people have already warned you to stay away from him, but I can see from your left hand that’s not going to happen. JOHN (savagely, through bared teeth): My wot? JOHN (snatching his hand away): What is? M (turning and walking a few paces away): Most people blunder round this city, and all they see are streets and shops and cars. When you walk with Sherlock Holmes, you see the battlefield. (He turns towards John again.) You’ve seen it already, haven’t you? JOHN: What’s wrong with my hand? M: You have an intermittent tremor in your left hand. M: Your therapist thinks it’s post-traumatic stress disorder. She thinks you’re haunted by memories of your military service. JOHN (angry and distressed): Who the hell are you? How do you know that? M: Fire her. She’s got it the wrong way round. You’re under stress right now and your hand is perfectly steady. M: You’re not haunted by the war, Doctor Watson. You miss it. M (in a whisper): Welcome back. M (casually twirling his umbrella as he goes): Time to choose a side, Doctor Watson. NOT-ANTHEA: I’m to take you home. JOHN (turning and walking towards her): Er, Baker Street. Two two one B Baker Street. But I need to stop off somewhere first. Later, John opens the door into his bedsit and switches on the light. Walking inside and closing the door behind him, he goes across to the desk and opens the drawer, taking out his pistol. Checking the clip, he tucks the gun into the back of the waistband of his jeans and turns to leave again. Later again, the car pulls up outside 221B Baker Street. Not-Anthea is still rivetted by whatever she’s typing on her phone [that must be one heck of a running blog that she’s writing]. John looks across to her. JOHN: Listen, your boss – any chance you could not tell him this is where I went? JOHN: You’ve told him already, haven’t you? JOHN: Hey, um ... do you ever get any free time? NOT-ANTHEA (sarcastically) : Oh, yeah. Lots. Thanks! I've particularly wanted to do that scene more than anything else in the episode, because I had the idea ages ago of how to not identify who the man is for the benefit of the (admittedly very few) people who might read this before seeing the episode. Also, my absolute favourite bit of the entire episode is where Mycroft stands there expecting John to come to him, and John just digs his heels in and refuses to budge. It's such a perfect moment in showing us who John is. You're very welcome to PM me or even post your questions here if you'd like, cos I don't guarantee that - even being English - I can explain the moments you're thinking of! But I'm certainly willing to give it a go. I agree with your second interpretation of Sherlock's snide comment on "I'll be mother." We've heard the Holmes brothers mention "Mummy," but we've never heard any reference whatsoever to their father. If he wasn't around (much, or at all), Mycroft may well have assumed the "man of the house" role at an early age. That does leave open the question of whether he's so paternal toward Sherlock because of that history, or whether he assumed that role because he's just naturally a paternal sort of person. And thanks (!) for doing the S1 transcripts. They're a wonderful resource for quoting episodes (accurately) on forums, not just for writing fanfic. P.S. : I've always assumed that not-Anthea was playing a video game, rather than texting. But now that you mention it, I can see it either way. Thanks for doing these! You really bring the scene alive along with the accurate transcription! I've always thought Mycroft twirling his umbrella might be a signal to Not-Althea - or whoever's texting her - that the interview was over and she could see John home. I have some questions too, but will read through your other remarkable transcripts to see if they've been answered! And if they haven't, you're welcome to come back and ask ... though I don't promise to have the answers! Hi, I have read most of your transcripts ... I think they're amazing. The only thing I wanted to mention is that (in the quote below) I always though M said 'Via her', not 'fire her'. As in, he got the information via John's therapist. Anyways, thanks for your work, it's great! Thank you - I'm glad you like the transcripts. I do believe that it's "Fire her." M isn't patient with people who aren't correct, so he thinks that John should get rid of his therapist because she's not helping him. It's the last one that amazes me the most. I see people misquote very often. I admit that I even do it myself. But you have got this so crazy accurate, that it's hard to believe that this is fan-made and not the original script. I also like how you refer to him as 'M' when he is still unidentified, and that you call her "Not-Anthea." (It's in my head-canon that she is constantly texting either Mycroft or her boyfriend, the latter of which eagerly texts her back every time.) This was very useful to me for writing fan fiction, as you mentioned. I write about Anderson a lot more than I probably should, so it's nice to have this available to check on his lines and actions. Basically, what I'm trying to say here is that you're awesome, and deserve lots of presents for your hard work on these transcripts. Thank you so much for such a lovely comment! I do work very hard to make these as accurate as possible. I enjoyed writing the 'M' scene in that way, not revealing who he was because we aren't meant to be sure at that time. So at the end of this episode we find out that John was not shot on his leg, he was actually shot on his left sholder. There is nothing wrong with his leg!He runs after Sherlock when they are chasing the cabbie. So then why did he fake his leg injuring? In your opinion what was the purpose of this? I keep goggling possible answers but find nothing. My thoughts are that because he has trust issues he rather allow people to think that he has a leg injuring rather than know that he actually has been shot on his arm/sholder area. He just doesn't trust people enough to know the real him...I don't know. I probably wrong, what do you think? John didn't 'fake' being shot in the leg. He has a psychosomatic limp - it's one of the things that Sherlock first deduces about him in the lab at Bart's. As soon as John is facing danger, or his new friend is, the limp disappears. The leg vs shoulder thing is actually an affectionate dig at Arthur Conan Doyle who forgot where Watson had been shot. In some stories Watson says he was invalided home because he was shot in the shoulder; in others he says it was in the leg. 3rd-Feb-2014 08:21 pm (UTC) - Why is John looking around? "Later, John opens the door into his bedsit and switches on the light. Walking inside and closing the door behind him, he goes across to the desk and opens the drawer, taking out his pistol. Checking the clip, he tucks the gun into the back of the waistband of his jeans and turns to leave again." A couple of times when John is retrieving his gun from a drawer, he looks up as if making sure no one is watching him. But he lives in a "bedsit", by himself. Why does he do this? 3rd-Feb-2014 08:23 pm (UTC) - Re: Why is John looking around? Well, he's just met some really weird bloke who seems to know everything about him, and who can turn CCTV cameras around! I think it's quite natural that he should be a bit nervous about whether someone's peering in the window and watching him! 12th-Feb-2014 04:53 pm (UTC) - You are a princess! I just wanted to say thank you for doing this! You have made my life a lot easier and saved me hours of tedious transcription. I am using an analysis of a scene for a doctoral class I"m taking, and I could kiss you right now for letting me steal your hard work. Mwah! Has anyone else noticed that the chair that Mycroft wants John to sit on seems to move around as the scene progresses? It seems to be further and further away from John as their conversation continues! Quite a magical chair! Here is the link to the Tumbler post: http://solrosan.tumblr.com/post/74921590001/ibelieveinmycroft-donttouchsherlock-so-now. Thanks again for all your wonderful work. I was aware of the name in the script, because I bought the boxset which included the script a few months ago. I have deliberately not changed her name in the transcript because this script isn't the final version. It isn't word-for-word what appeared in the episode - for instance there's a scene in this script version which didn't make it to the episode. It's possible that future drafts of the script changed her name. Additionally, in the end credits of the broadcast episode, she is named as "Anthea". But thank you for telling me this! This is a hilarious reversal of A Study in Scarlet, in which the policeman says it means Rachel and Holmes shows off by identifying it, CORRECTLY, as "rache," the German for "revenge." You could not make fun of Conan Doyle more pointedly than putting the words of his far-fetched theory in Anderson's mouth, and letting Sherlock snort at it. And yet the show isn't bashing the stories, but saluting them--not least in the way it follows in ACD's footsteps by creating fantastical plots. 7th-Jan-2015 03:38 pm (UTC) - Thanks a lot! I use this in a writing class to demonstrate the process of analysis: observing, making a claim based on the observations, explaining the connections between the observation and the conclusion drawn. Thanks for providing a script that I can excerpt from and then print out for my students! I'm so glad that this has been useful to you. Thank you for writing to let me know.